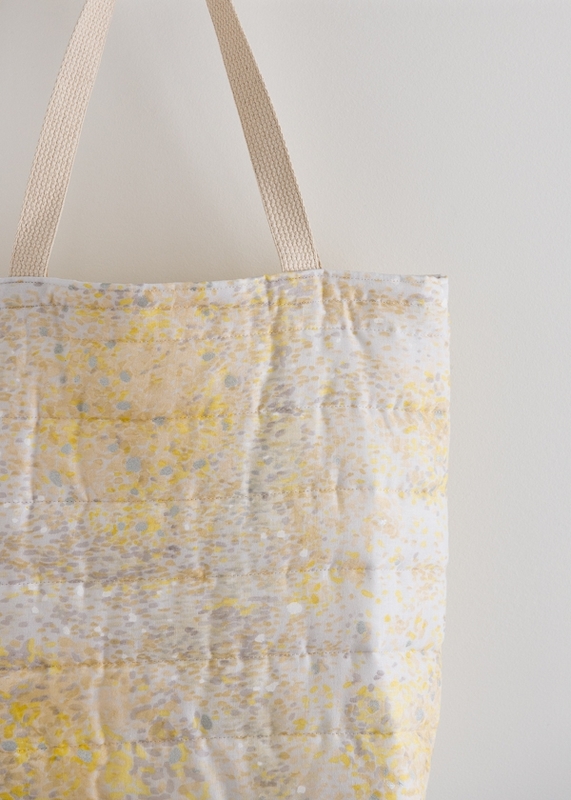 Nani Iro’s Quilted Double Gauze is just one of those fabrics that makes you want to sew! The prints and colors are absolutely beautiful, and if you’re long on inspiration but short on time, the fact that it’s pre-quilted opens up a world of potential. 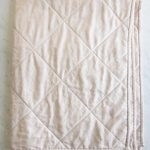 Just add bias tape and make a quick-as-a-wink quilted blanket. 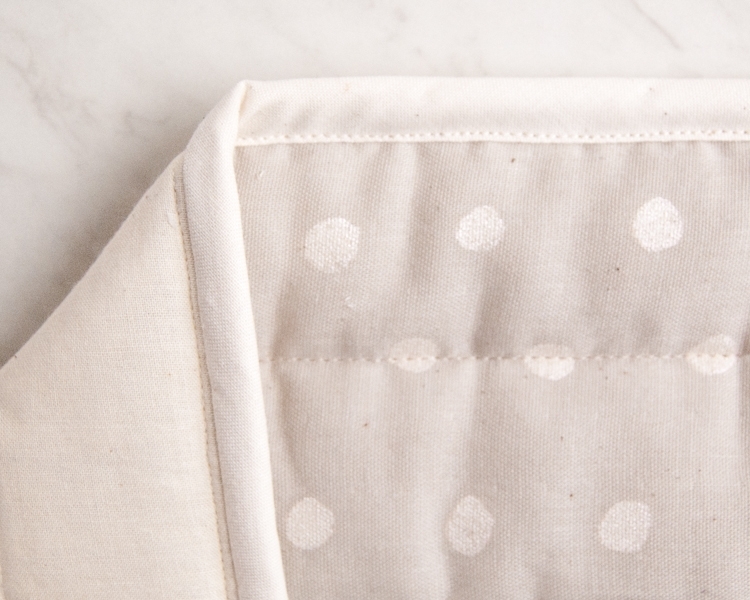 Whip up a cute little baby jacket in no time flat. 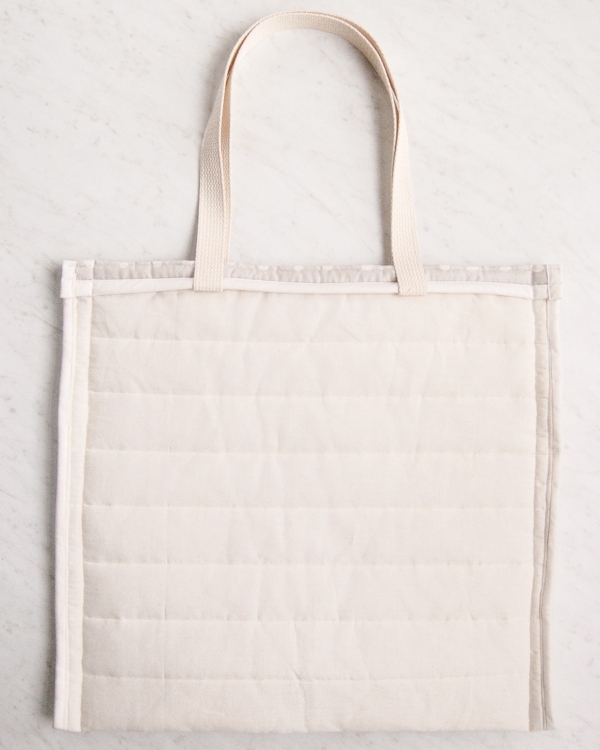 Or try this super adorable Puffy Tote! 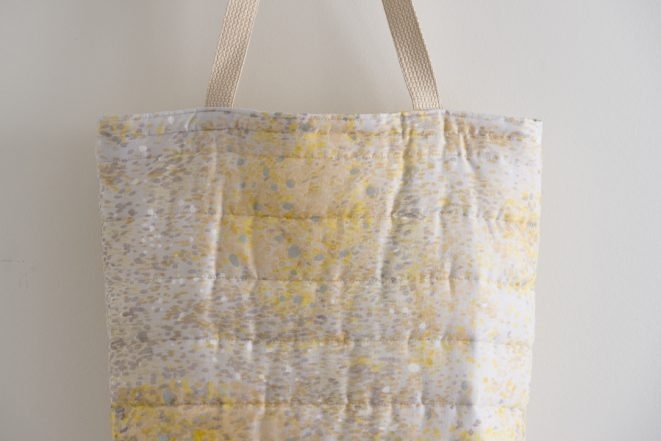 ½ yard of Nani Iro’s Quilted Double Gauze. 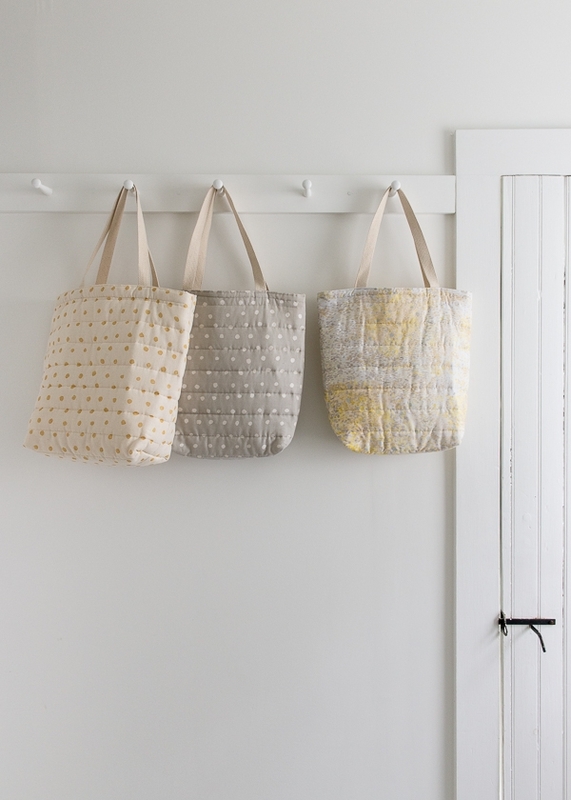 We used Pocho in Ecru/Gold, Pocho in Gray/White, and Bird’s Eye in Moe Gray/Yellow. One 110-yard spool of Gutermann’s Cotton Sewing Thread. We used color 1040. 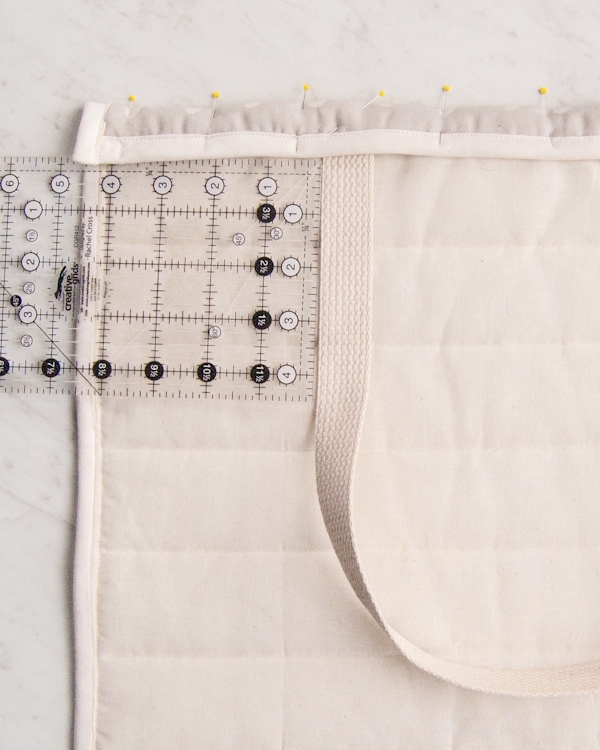 Use your machine’s walking foot for all of the sewing in this pattern. Orient the fabric so its wrong side is facing up. 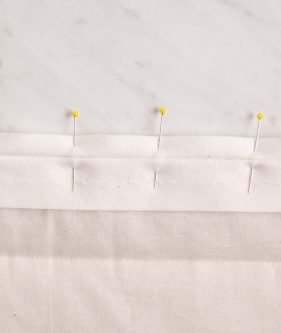 Unfold one long edge of an 18-inch length of bias tape, and with its wrong side facing up, pin the bias tape’s raw edge flush along an 18-inch edge of the fabric. Note that the right side of the bias tape faces the wrong side of the fabric. 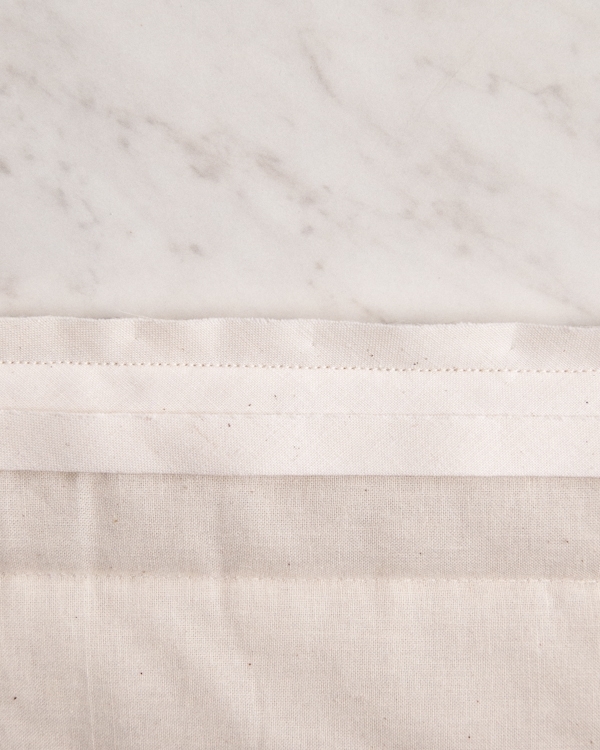 Sew along the bias tape’s crease, as shown above. 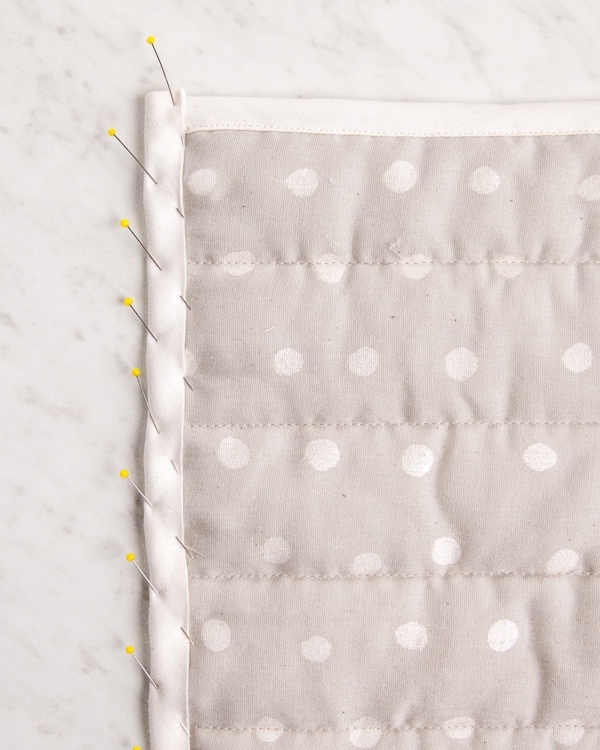 Pull the folded edge of the bias tape over to the right side of the fabric. 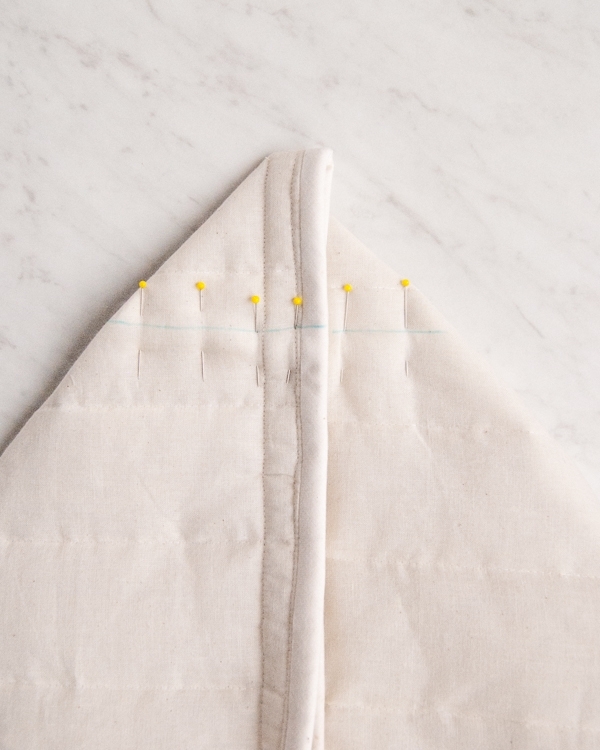 Pull it so that the folded edge is just a bit beyond the seam you just sewed. 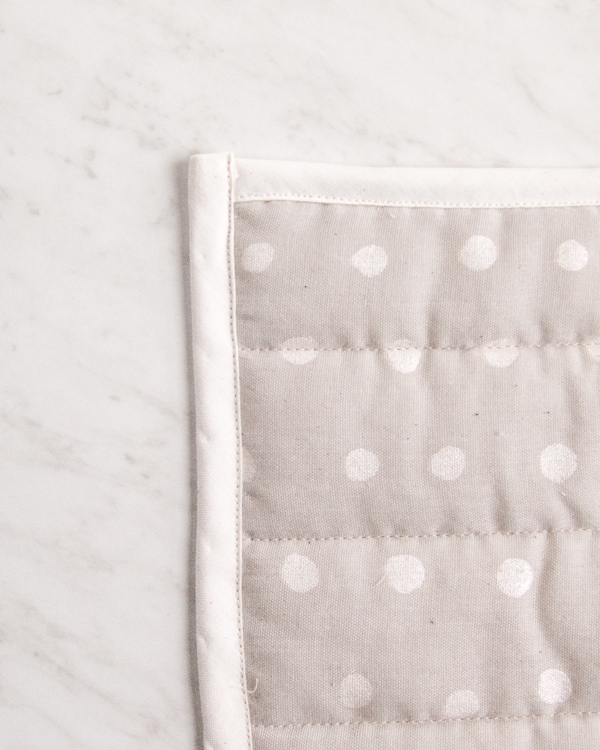 Pin this fold down. Edgestitch along the edge of the fold to sew down the second side of the bias tape. Using the second piece of 18-inch bias tape, bind the other 18-inch edge of the fabric in the same way. Next, pin one of the longer pieces of bias tape to a long side of the fabric in the same manner. Here, the bias tape is 2 inches longer than the fabric, so leave 1 inch of bias tape overhanging at each end of the fabric. 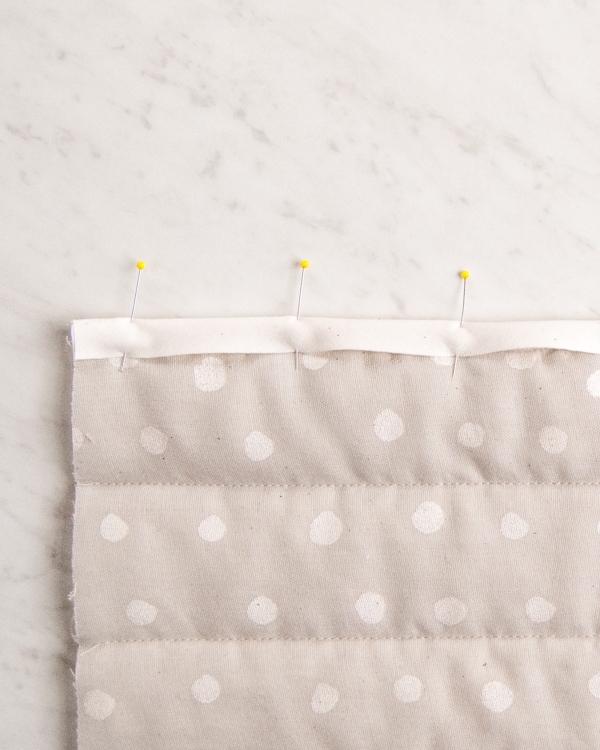 Sew this tape down along the fold, just as you did for the other sides. 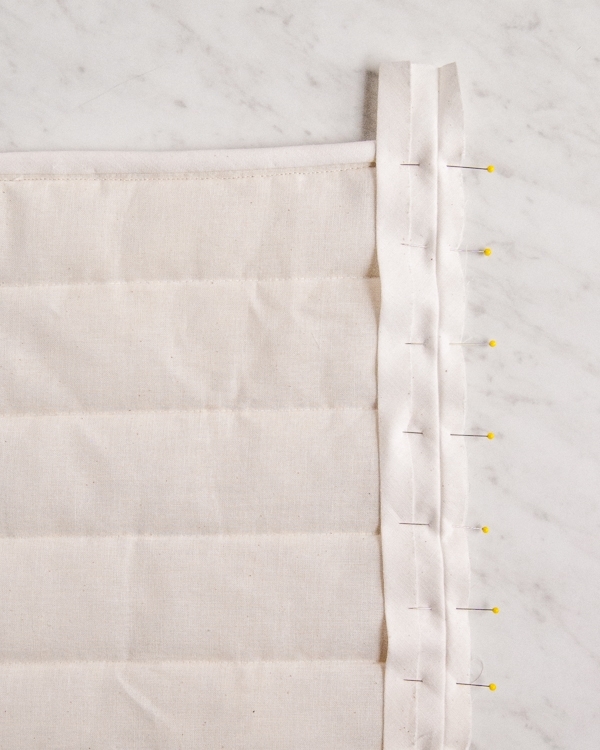 Pull the folded edge of the bias tape over to the right side of the fabric, and pin it down as you did for the other sides, except before you pin down each end, fold the 1-inch overhang under to neatly finish. Edgestitch along the edge of the fold. With the remaining piece of bias tape, bind the second long edge of the fabric in the same way. Fold one of the short sides of the Bag Panel 1 inch towards the wrong side. Press and pin this fold into place. 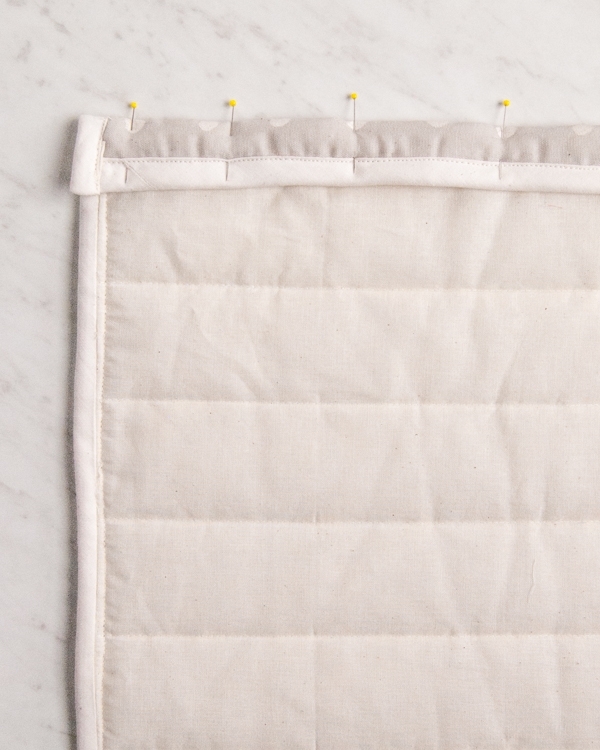 With the wrong side of the Bag Panel facing up, insert one of the raw ends of one of the webbing pieces under the fold, 4 ½ inches from the left corner. Pin the webbing into place. Then, making sure not to twist the webbing, insert the second raw end under the fold, 4 ½ inches from the right corner. Pin it into place, as well. 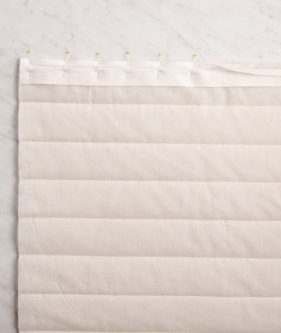 Sew down this fold just above the top edge of the bias tape. 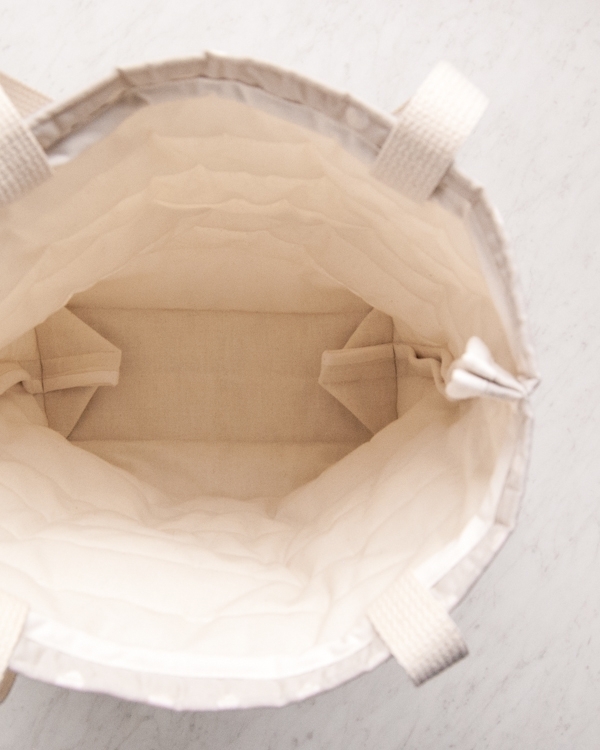 Flip up the webbing so that it’s lying above the Bag Panel and pin it in this orientation. 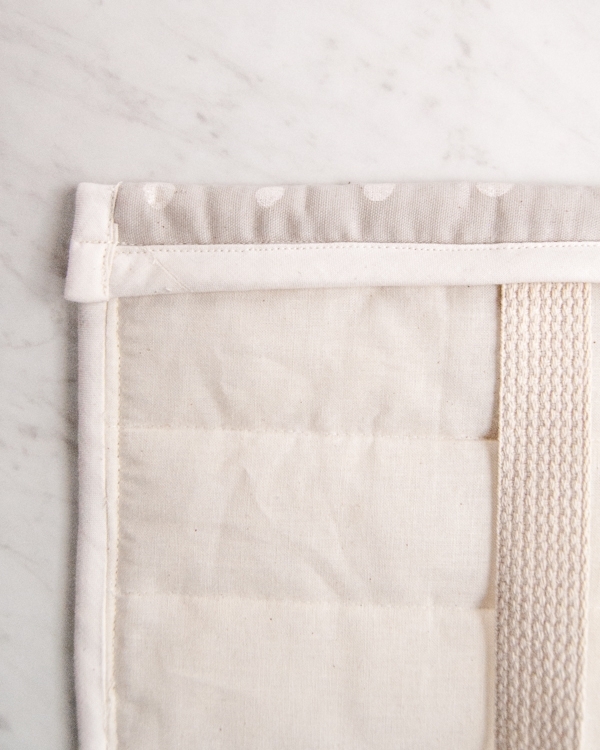 To secure the handle, sew a seam a ¼-inch from the top fold along this whole side. 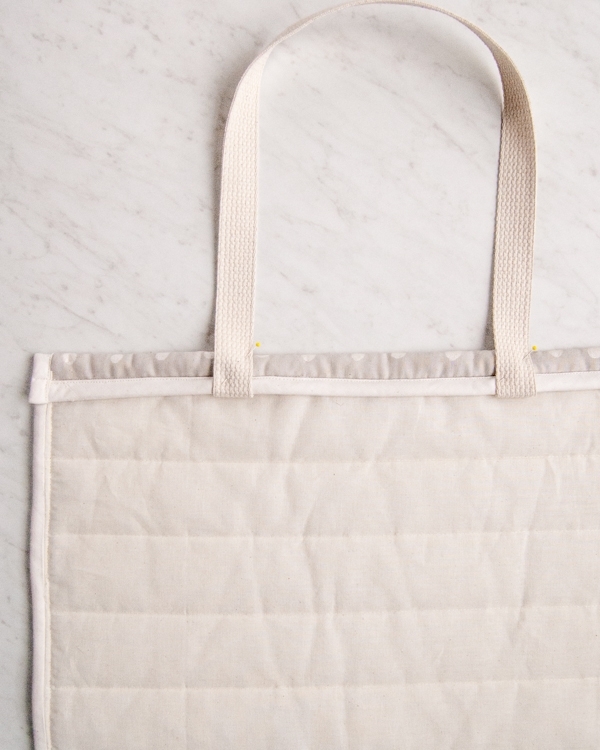 Repeat these steps on the opposite 18-inch side of the Bag Panel, folding the bound edge and adding the handle. Now fold the Bag Panel in half, right sides together, so that the edges with the handles meet up. Press this fold and pin the left and right sides together. 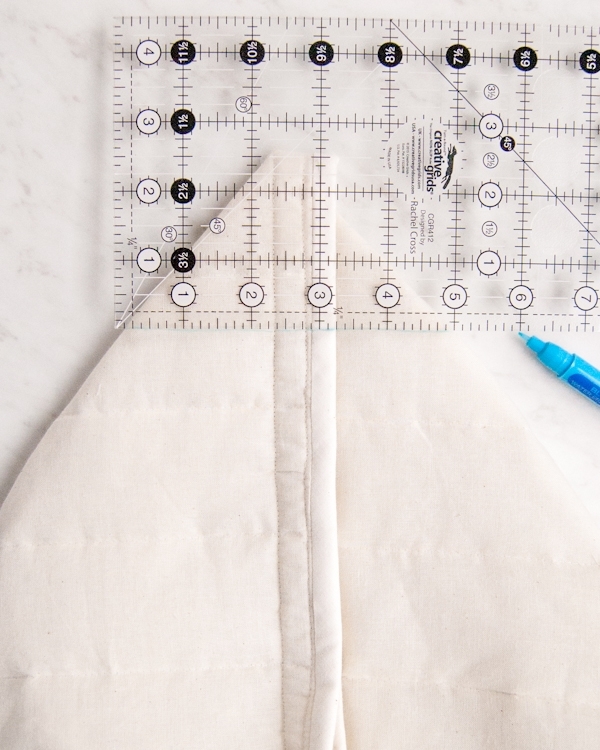 Sew each pinned side together with a 1-inch seam allowance. This is now the Bag. 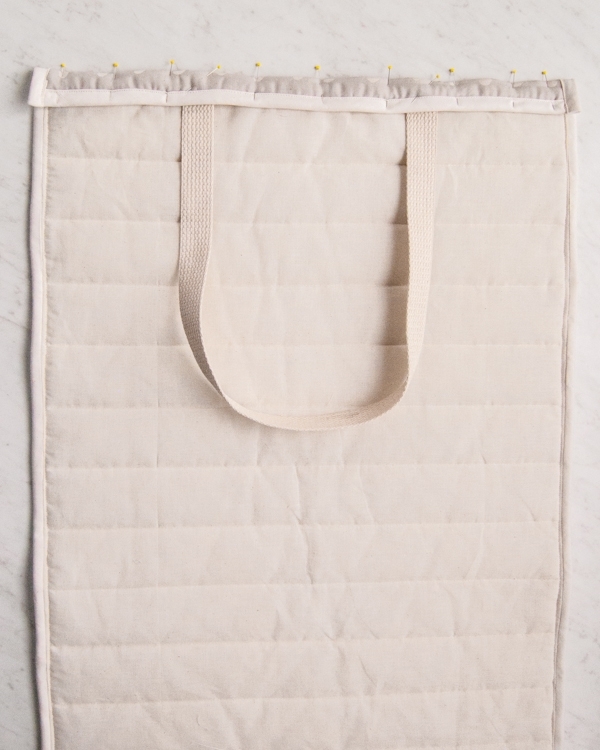 Open up the Bag so that one of the side seams is lying on top of the Bag’s bottom fold so that the corner is a 90-degree angle and the side seam bisects it. Fold the side seam allowance to one side (it doesn’t matter which side). Now, draw a line that is perpendicular to the side seam at the spot where the left edge of the corner is five inches from the right edge. 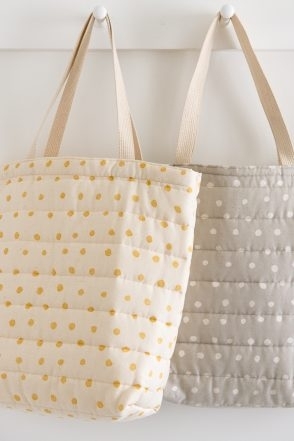 Pin the two sides of the Bag together along this line and then sew along the line. Repeat for the opposite corner of the Bag. Now turn the Bag right sides out. 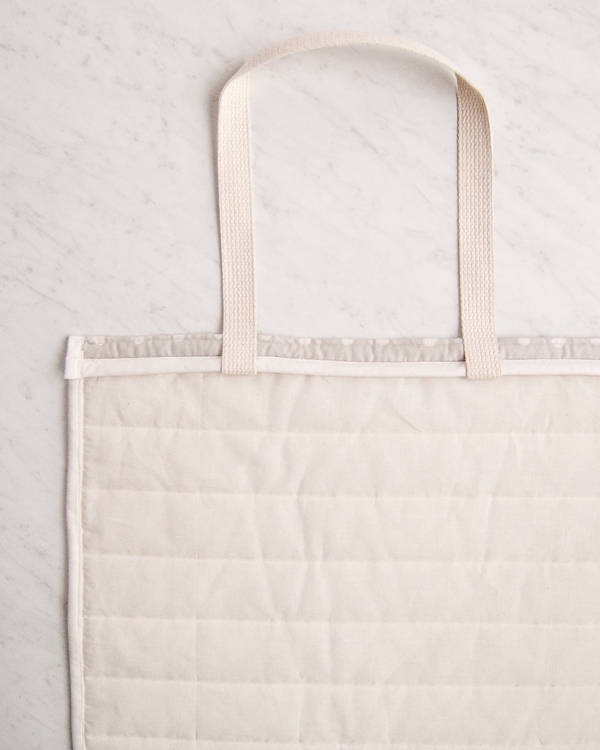 The boxed corners fold automatically to the bottom of the Bag, and you’re all done! THE PATTERN. COULD YOU PLEASE HELP ME? You can easily print or save using the PRINT button! If you’re on a desktop version of the site, you will find the Print icon in the right margin just below the Save to Favorites button. If you’re on a mobile version of the site, you will find the Print icon below the pattern and above the comments. Do you think french seams would work well for this project, or is the fabric too bulky? I’m thinking that french seams for the sides and bottom boxed corners would avoid some of the need for bias tape, like with your Quilted Zipper Pouches project. I think that might work but I think you’d have to add a little extra width. Maybe cut it 1/2-inch wider, so 18 1/2-inches wide. Then sew the first part of the French Seam (with right sides out) with a 1/4 inch seam allowance and the second part of the seam (right sides together) with a 1-inch seam allowance. Thanks for getting in touch! Please let us know if this works out for you! 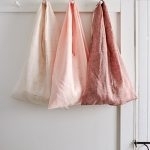 What a wonderful way to use this stunning fabric. My question was . Do you carry Women sizes (W) ? I need size 18W. I’m not sure what your question is. 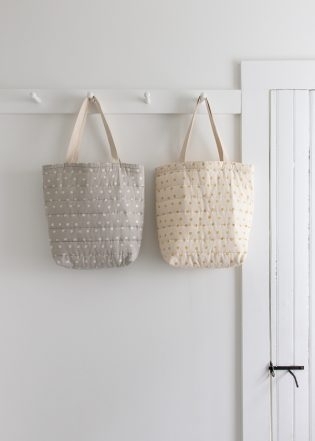 We do offer knitting and sewing patterns in women’s sizes but this is a bag pattern. 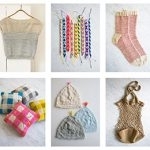 The sizes for our knitting and sewing patterns are listed with finished measurements, not dress sizes. I really hope I’ve answered your question! Please let me know! Is this fabric already quilted? The description and pictures do not look like it is. 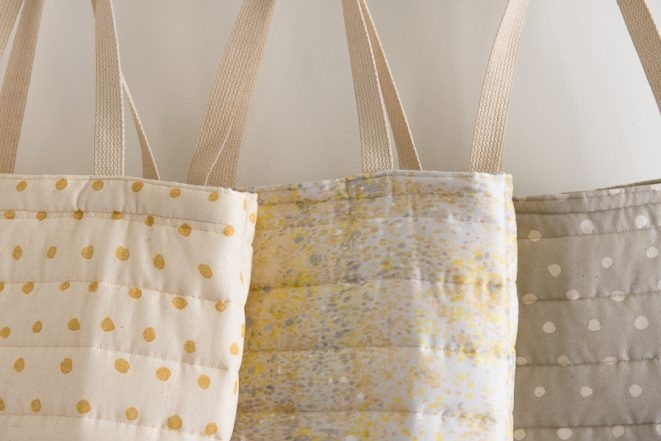 If not, is there a tutorial on how to quilt it as shown for the bags and blankets? Thanks for writing in! The fabric that we used here does come pre-quilted! 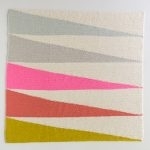 At present, we do not have the pre-quilted fabric but do sell the Nani Iro Double Gauze on it’s own. 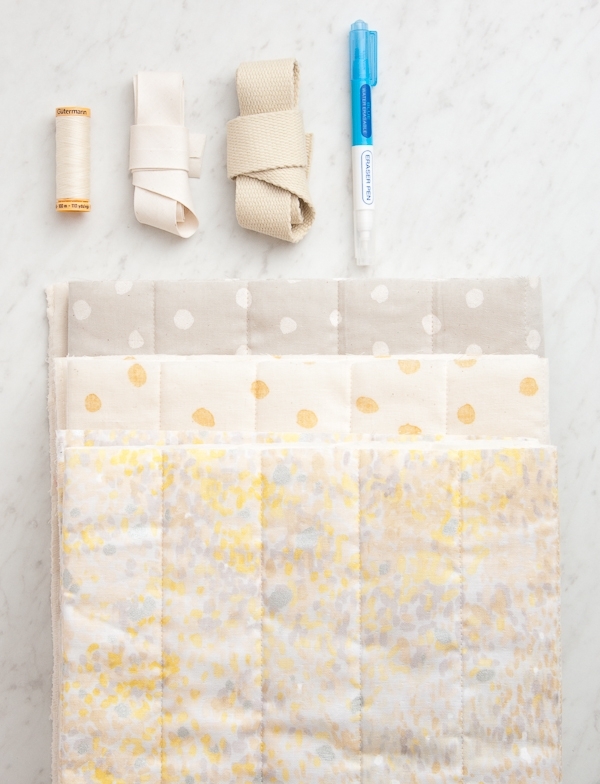 While we do not have a tutorial on how to quilt fabrics such as are shown above, our Whole Cloth Quilt pattern could work well to show you the basics of how to create quilted fabric! Adorable! And easy enough for a sewing knucklehead like me! Thank you for this gorgeous pattern. 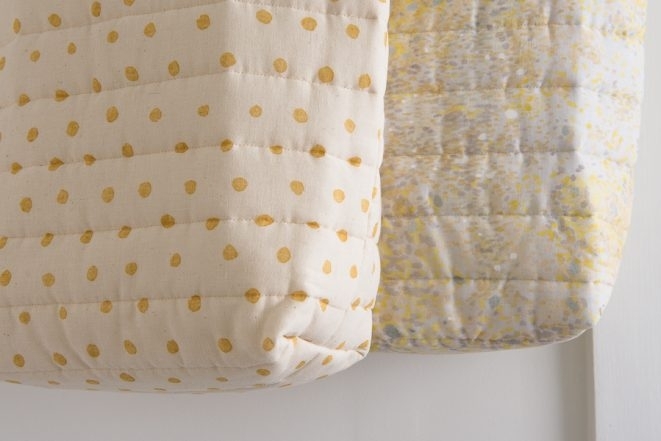 Could you please let me know if the batting in this quilted Nani Iro fabric is cotton or polyester? It’s polyester. Thanks for your question! I love this fabric look. Am I too late to get this pattern free? I cannot find the pattern download. Any help? No need to worry! The pattern is free and is above on this page. No need to download it though you can print if you like using the print icon in the right hand column! Do you still cary pre quilted double gauze? Thank you for your question! 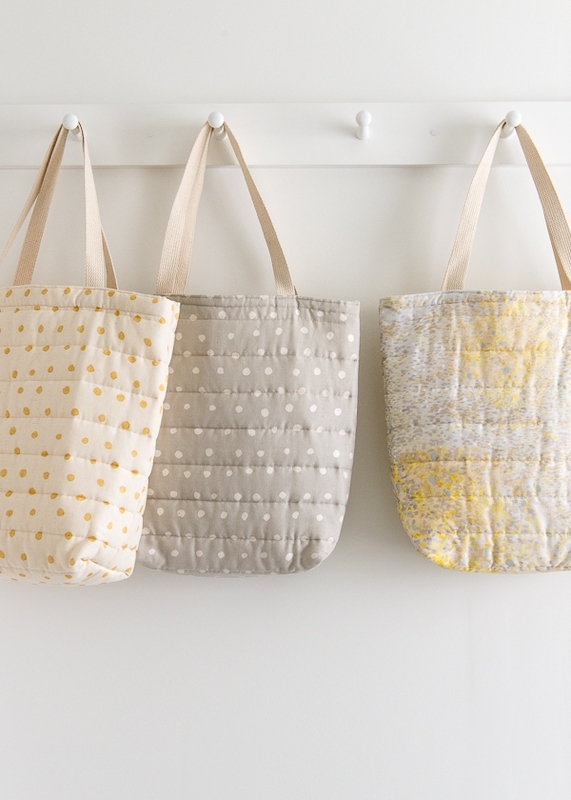 Unfortunately, because Nani Iro’s fabrics are seasonal when we run out we can no longer get it. It looks like we no longer have any of the Quilted Double Gauze and wether or not we get it again will depend on what is available next season. I hope this helps and sorry we no longer have what you were interested in! Will you be getting more this quilted fabric? 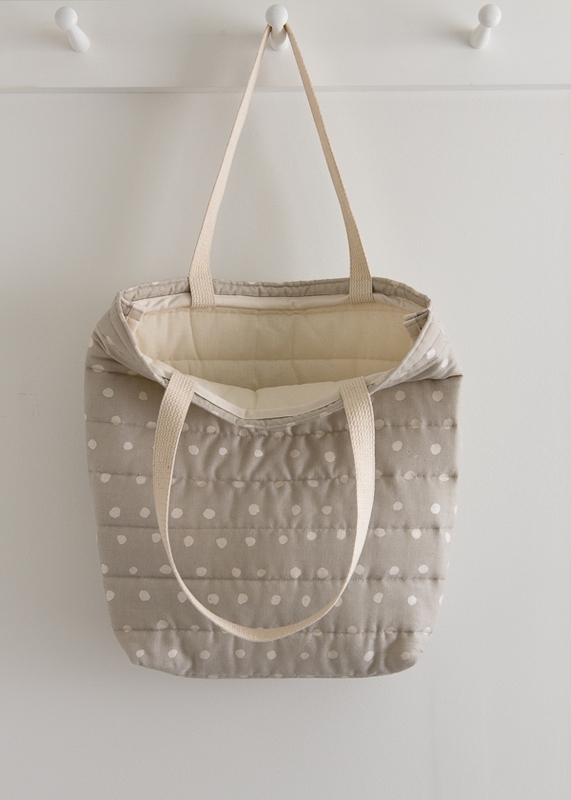 Or do you carry another quilted fabric? 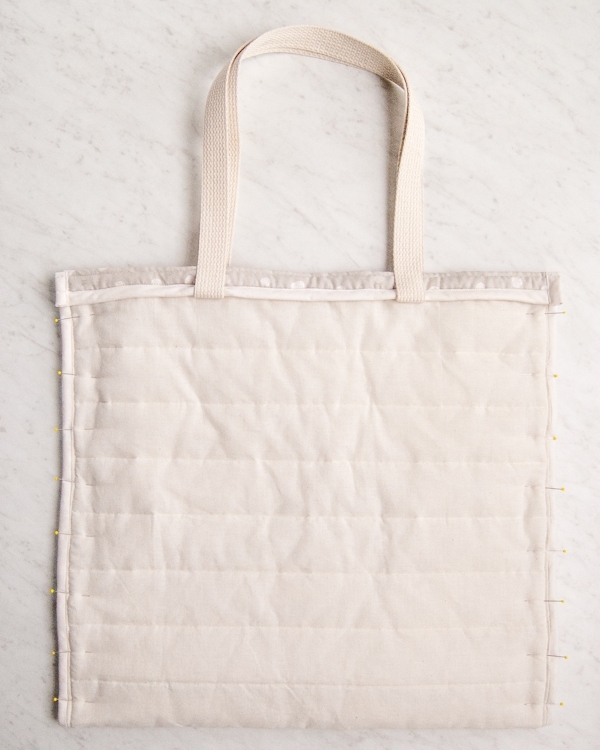 The current season that the material link directs to is for un-quilted double gauze. Thank you for reaching out and for your interest in this pattern! Unfortunately we no longer carry any quilted fabrics. I’m sorry I can’t be more helpful! Good luck on your search and happy sewing!